You’re a Liverpool resident and you’re about to move to a new house. But you’re wondering whether you should do the home moving yourself or hire help. We’ll help you decide. Liverpool House removals are not something one does every day. They take planning and certain amount of experience, tools and equipment that the average person probably does not have. Over 90% of everything you own as a person are objects in your house – furniture, electronics, clothing etc. And while a person is not defined by what he or she owns those objects are an inseparable part of their life. Taking that under consideration, would you risk moving your household and not entrusting the job to trained professionals? There are things that are just too important to take chances and with our services you’re taking none. You will be serviced by a team of highly trained, extremely skilled domestic removals experts. No matter where in Liverpool you live we can send a team of moving experts at a time and date convenient for you. The services we provide are wholesome and include anything from safe transportation to packaging of the items and furniture if you require. Our company takes full responsibility for your belonging and we assure safe and speedy delivery from and to any address in Liverpool. The highly professional movers employed in our company are prepared to handle the logistics of moving anythings from from and fragile objects to big pieces or large amounts of furniture. We take full responsibility and guarantee for your items safe delivery. Special attention will be paid to item packaging, arrangement during transportation and loading and unloading from the vehicle. Our furniture removal services are flexible and you’re able to request additional movers or another vehicle if you consider that more help is needed. The pricing we offer is adjustable to the home removals services different clients require and we’re strong believers in the unique approach to each of our customers’ needs. We strive only for 100% customer satisfaction and you can be sure our affordable prices are in no way at the expense of service quality. Our dedicated support team is there to answer any question or inquiries you might have and we’re available for approach every day, seven days of the week via phone or email. Also we believe it is of highest importance to deliver you a quick resolution in the unlikely event of problems arising concerning our services. 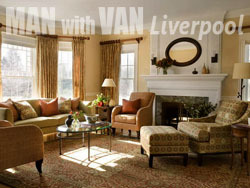 Call our man with van teams in Liverpool or write as an email and our experts will consult you on what course of action is most appropriate concerning your home removal needs. You can expect only friendliness and complete dedication from both our customer support and our expert movers and you can trust us to turn your house moving into a safe, smooth and fun experience you’ll probably want to share with your friends afterward.